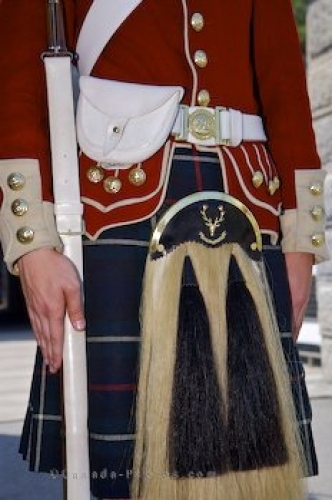 A kilt is worn by a soldier at the Halifax Citadel in Nova Scotia, Canada as part of their Scottish uniform with a sporran hanging in front. A sporran is a decorative piece of the Scottish uniform that is attached around the waist that can be made of fur or leather. Details of the uniform and sporran of a sentry, a soldier stationed to guard the entrance of the Halifax Citadel, a National Historic Site, Halifax, Halifax Metro, Nova Scotia, Canada. Picture of a sporran, a piece of the Scottish uniform a the Halifax Citadel in Nova Scotia.